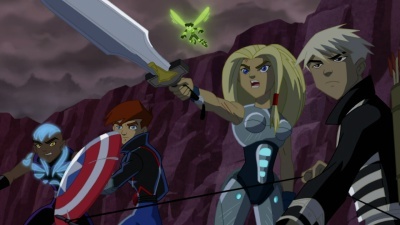 be cynical, go ahead and shrug off Next Avengers: Heroes of Tomorrow as some shameless Teen Titans knockoff. 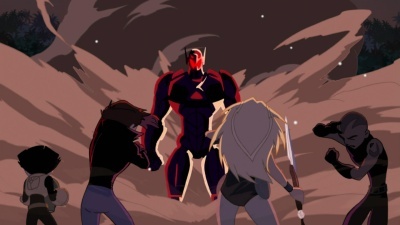 It's your loss: Next Avengers is kinda cute and playful like Teen Titans, sure, but its mix of fun, wide-eyed adventure, and a heckuva lot of action in the classic Marvel tradition make this by far the best of their direct-to-video animated flicks to date. animation is colored with sleek, cat-like movements that look really slick in motion, and it's just subtle enough to not feel like I'm being bludgeoned over the head that he's the Black Panther's son. Next Avengers is the only of these animated flicks from Marvel to score a PG rating, but just because there isn't any real body count (the Avengers' deaths are all told in a bedtime story) or any of the red stuff slathered across the screen doesn't mean the action's any less intense. Starting off with squabbles between the kids and climaxing in a massive assault against the invincible Ultron, the scale and stakes of the battles get bigger and bigger as the movie goes along. Next Avengers infuses that epic final confrontation with intensity and gravity without ever feeling bleak or depressing -- Ultron's power and cold ruthlessness make for a really menacing adversary -- and that reminded me of the Marvel comics I grew up reading. Sure, the movie's kinda cutesy and definitely skews young, but much like the classic comics that inspired it, Next Avengers never feels like it's pandering. While some Marvel zombies might gasp in horror that Next Avengers doesn't fit snugly into continuity -- here, Tony Stark invented Ultron -- there are some neat nods to the comics. Azari's mom isn't spelled out in the movie, although fans who've kept up with "Black Panther" will immediately pick up on who she is, and that definitely plays into his character. This spin on the Hulk so many years in the future reminds me a lot of the Maestro in Peter David and George Perez' "Future Imperfect" miniseries, which isn't some obvious pop-culture touchstone but made the lifelong comic geek in me feel all warm and fuzzy. Next Avengers is pretty accessible without knowing Marvel mythology chapter and verse, but enough winks are scattered across the background to give longtime fans something extra to appreciate. I had a heckuva lot of fun with Next Avengers: it's cute and playful, overflowing with some really outstanding action, and sharply written enough that I'd stick around with these pint-sized superheroes if there's a sequel down the road. Recommended. still seems kind of choppy to my eyes, but I'd chalk that up to the way Next Avengers was assembled and not a misstep specific to this Blu-ray release. Next Avengers isn't a knockout on Blu-ray, but it still looks pretty terrific, and I'd bet it's a near-perfect representation of the original master. 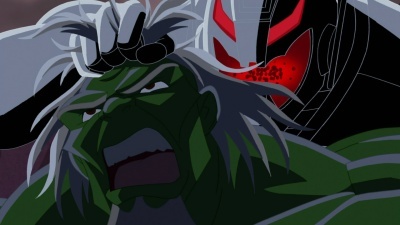 Audio: All of Marvel's animated flicks on Blu-ray have sported lossless or uncompressed eight channel soundtracks, and...yup, Next Avengers is packing a 7.1 DTS-HD Master Audio track too. Even though it's not quite as aggressive as The Invincible Iron Man, the step up in audio is the biggest selling point for this Blu-ray disc over the DVD. The clarity...the distinctness of each and every element in the mix...is outstanding, with the recording of the cast standing out as exceptionally crisp and clean. The mix grabs hold of all of the speakers it has at its fingertips, filling every channel with the sounds of the swirling info-screens in Ultron's lair, the primal roar of the Hulk, aerial dogfights against the Iron Avengers, and pint-sized Pym zipping across the screen. The fight sequences keep pummeling away at the surrounds and are teeming with smooth pans from one channel to the next as well. The low-end is tight and punchy too, from the dull thud of Torunn's sword being flung into the rocky ground to the Hulk and Ultron literally leveling mountains. Next Avengers' lossless audio sounds great, and it's another in a long line of strong efforts from Lionsgate. A Dolby Digital 5.1 dub in Spanish has also been tacked on alongside subtitle streams in English (SDH) and Spanish. extras are awfully thin this time around, and they're pretty much limited to two short featurettes. "Legacy: The Making of Next Avengers: Heroes of Tomorrow" (11 min.) piles on interviews with a gaggle of writers and producers, but all they really do is describe the tone they're aiming for, recap the plot of the movie, and rattle off character notes that've already been clearly spelled out on-screen. It's kinda bland and doesn't mean all that much to anyone who's actually watched the movie, although there is a peek at how the character designs evolved, and that might leave "Legacy" worth a quick skim. The only other featurette is "Kid Power: The Next Generation of Marvel" (10 min. ), which highlights some of the other teen superhero books under the Marvel banner. A bunch of series are touched on in passing -- "Runaways" (yay), "Young Avengers", and "New Mutants", f'r instance -- but for the most part, this featurette just seems to have been tossed on to plug "Young X-Men", "Franklin Richards: Son of a Genius", and "Power Pack". Y'know, kind of a shameless "hey, if you dug Next Avengers, fork over a few bucks and buy these..." sorta thing. It's worth it just to see Chris Eliopoulos at work, though. That's really it. The only other extras are plugs for a couple of upcoming Hulk versus... animated flicks and a few other trailers. All of the disc's extras are in high definition, by the way. 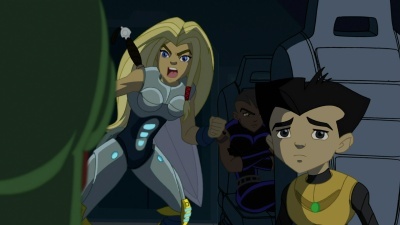 Conclusion: I really dug Next Avengers: Heroes of Tomorrow, which juggles a kinda smirking playfulness in with a bunch of massive and ridiculously cool brawls. Not only is this the best of Marvel's animated flicks so far, it's the only one I'd feel all that comfortable pulling out to get a younger kid hooked on this sort of superheroic action, and it's...well, the only one I think I'd give a second spin to watch myself. Next Avengers looks pretty nice and sounds great on Blu-ray, and although the extras are all pretty lightweight, at least they're in high-def. Nah, we're not talking about some movie that'll redefine the way you look at life or make you want to dust off your old longboxes, but Next Avengers is a lot of fun, and here's hoping Marvel's able to kickstart it into a franchise. Recommended.